Bradford Grammar School (BGS) is ranked as a Top Ten UK best value independent school for girls and boys aged 6 to 18 in Yorkshire. It is a co-educational, independent school in Frizinghall, Bradford, West Yorkshire, England. Headmaster, Simon Hinchliffe is a member of the Headmasters' and Headmistresses' Conference (HMC). The school was founded in 1548 and granted its Charter by King Charles II in 1662. Until 1975 it was a direct grant grammar school, and when this scheme was abolished it chose to become independent. The school motto is Latin: Hoc Age (Do This). Entrance is by examination, except for the Sixth Form, where admission is based on GCSE results. The school gives means-tested bursaries to help with fees. Bradford Grammar School, unusually for a private school, does not offer scholarships based on academic achievement, a policy enforced by a previous headmaster, Stephen Davidson. In 2013, the pass rate for GCSE (Grades A* - C) was 99%, which was equalled by the A-Level students. 31 courses are offered for A-Levels, and 97% of sixth-form pupils went on to study further education or deferred a year. The standard requirement for entry to the sixth form is nine B grades at GCSE, in 2008 the lower sixth had an average equivalent to ten A grades at GCSE. The pupil to teacher ratio is 15:1, and class sizes start at around 20 in the first year and are often below 10 by the final year. There are currently 934 pupils in the Senior School, including 267 in the Sixth Form and 188 in the Junior School (Clock House). The school became fully co-educational in September 1999. As at September 2011 687 boys and 435 girls were on the role. Currently there are 115 members of staff at the school. Over the past 15 years the school has completed a £14 million buildings development programme. In 2001 the school built a multi-million pound Sixth Form Centre, funded primarily by Roger Evans and by pupil fund-raising. Eminent former pupil David Hockney, contributed to the funding of the large theatre, where many school productions are performed, adjacent to the sports hall. The school's computing facilities have been updated regularly in the past few years, and the school now has ten IT suites. Pupils have access to their files and email from home, by remote login and have access to the internet and email throughout the day. The school has a Design Technology department with 4 workshops, 3 classrooms and 2 CAD suites. The school's large art department is spread over 5 classrooms, one of which is reserved for the use of sixth form students. A recently-built three-storey building houses the departments of chemistry and the social sciences, while a brand new library, currently being constructed, will provide additional IT facilities and study space. Other recent developments include a new sports pavilion and a Learning Link, which joins the main building to the newer science buildings and library. The grammar school also has a classics department; it is compulsory for all pupils to study Latin for two years, and pupils can choose to go on to study Latin, Classical Civilisation or Ancient Greek to A-Level. In Modern Languages, pupils have the option to study Japanese, Chinese (not to GCSE or A level standard), Russian, Spanish, French and German, and the school has a laboratory to facilitate the active learning of modern languages. There are twenty networked computers, all equipped with language software that allow pupils to speak to a member of staff, as well as to be paired up to perform role-plays. The school's first sport for boys is rugby union, and for girls it is netball or hockey, but there are opportunities to take part in other sports including squash, tennis, table-tennis, cross-country, swimming, water polo, cricket,and rowing, on the River Aire. The school has an all-weather pitch used for hockey and football as well as nine courts used for netball and tennis. The £1m pavilion, built in 2008, contains changing rooms and space for functions. The school has two squash courts (each with their own showers and changing rooms) that also have been revamped in the last few years. BGS has four rugby pitches, which in the summer are converted into two cricket grounds. The sports hall is large and has recently been refloored. The school has an equipped gym with rowing machines, cycling machines, a treadmill and weights which was modernised in 2011. The modern 25m swimming pool is open to staff and students before the start of school and swimming and is used for swimming and water polo training at lunchtimes and evenings. A further senior gym is used for fitness training and PE lessons. As an alternative or a supplement to extra-curricular sport, the school maintains a volunteer Combined Cadet Force. In the 1980s, this was reduced to just the Army contingent. However, in recent years the numbers have swelled and the RAF section has been reopened, and pupils now regularly fly and partake in RAF courses. The school owns its own 25-metre shooting range. In later years, The CCF has been regenerated by the efforts of Squadron leader Dheeraj Bhasin. Bhasin has served as a pilot in the Royal Air Force and has been the commandant of the Jaguar Weapons Training School and Head of Fast Jets. He has also served in Kosovo and taken a major role in Operation Enduring Freedom and Operation Iraqi Freedom. The school is known at national level for its competitive debating teams. Three pupils over the past ten years have been selected for the England Schools' Debating team which competes at the World Schools Debating Championships, and former pupils of the school have reached the Grand Final of the World Universities Debating Championships. The Music Department has many musical groups and clubs for pupils to join including; Senior Orchestra, Folk Group, Early Music Group, Senior Choir, Junior Choir, Junior Orchestra, Concert Band, Samba Band and String Group. The Music School is fully equipped with classrooms, a recording studio, auditorium and 12 private teaching rooms for individual instrument tuition. The school has a science club for the junior years, a physics group for sixth formers and a biology club, all of which meet regularly at lunchtimes. Pupils take part in the maths team challenge, maths challenge and olympiad, physics challenge and chemistry olympiad every year. The interior walls of the school are decorated with artwork by pupils and a number of David Hockney's works are on display in public and private areas of the school. The music suite has several practice rooms and holds concerts throughout the year including some with major orchestral works, some featuring one instrument and some featuring the musicians of a particular year group. A musical is staged every year and rock and folk concerts end the year. The Hockney Theatre hosts a programme through the year and a full-time technician manages a student production team to service the performances. Curriculum evenings by the lower school drama groups or the A-Level Theatre Studies groups are placed between plays written specifically for pupils, Shakespeare performances, comedies and musicals. Recent productions have included Oliver!, Grease, Hedda Gabler, As You Like It, Blood Brothers, The Merchant of Venice, Peer Gynt and The Merry Wives of Windsor. In March 2007 the BGS Dramatic Society staged The Wiz, a motown version of The Wizard of Oz.More recent shows are The Winters Tale produced by a year seven class. Founders Day is an annual event held at Bradford Cathedral to remember the start of the school and notable characters from its history. Attendance is compulsory for 1st to 4th years and some of the 6th form. Prize giving is held in the Price Hall. A number of speeches from a guest (the guest in 2008 was Lord (Digby) Jones of Birmingham), the chairman of the governors and the headmaster are given. Then prizes are presented to those who have performed well at any aspect of school life. The Spring Fair is held around the whole school, and has many stalls and entertaining activities, especially the army assault course and the drama workshops. This year it is held on Saturday, 8 May at the school. The Christmas Fair is held every year with the support of the Netball Parents Association, and includes many stalls from local businesses and pupils, as well as a Santa's Grotto, Mince Pies & Festive Music. The school also regularly takes part in charity fundraising events such as Children in Need and Comic Relief. The school grounds have been used as a helicopter landing ground by the royal family when they are visiting the local area due to its large fields. The most recent landing was by Prince William, in 2014. The "new" school building in Frizinghall was actually completed in 1939, however the start of the Second World prevented the building from being opened as a school. During the war, the main school building was used as a Primary Training Centre, and there is still evidence of this around the building. During this time, many of the pupils from BGS were evacuated to Settle and returned when the building was released from army occupation and completed. Inside the school there is a large memorial to the former pupils who died in the war. Frizinghall railway station closed in 1965 and remained closed for 22 years. During this time, staff and pupils at the school campaigned hard to get the station reopened. In the end, it was due to the efforts of an English teacher, Robin Sisson that the station was reopened. Now, over half of the passengers travelling on the Bradford lines alight or embark at Frizinghall railway station. Jonathan Brownlee (born 1990) British triathlete; brother of Alistair Brownlee. ↑ "History of the School". 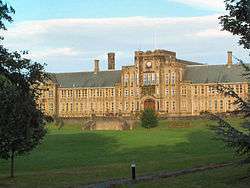 Bradford Grammar School. Retrieved 1 June 2010. ↑ "Bradford Grammar School - Bradford - West Yorkshire - BD9 4JP". ↑ "Sir Frank Watson Dyson. 1868-1939". ↑ "Janus: The Papers of C. T. R. Wilson". ↑ Schoolnet info Archived 17 June 2007 at the Wayback Machine. ↑ Oxford biography Archived 29 June 2007 at the Wayback Machine. ↑ Leeds University Honorary graduands Archived 1 May 2007 at the Wayback Machine. ↑ Autobiography Archived 27 September 2007 at the Wayback Machine. ↑ "University of Leeds Centenary 1904 - 2004 - Centenary celebration ceremony - Presentation addresses - Sir Ken Morrison citation, by Victor Watson". ↑ "Bio - David Hockney". ↑ PlayLouder interview Archived 29 September 2007 at the Wayback Machine. ↑ RFU profile Archived 30 September 2007 at the Wayback Machine.